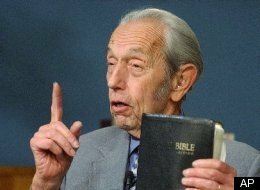 Harold Camping does not claim to be a pastor, and has never been formally trained to teach or preach the Bible, which he does on a regular basis through his radio ministry. I don't believe it is an absolute necessity for a teacher or preacher of God's Word to be formally trained, however I mention it only due to his mishandling of God's Word. In his case, it seems that formal training would have been good for him. Harold Camping is obsessed with the second coming of Christ. In his self published book “1994?” Harold Camping states the end of the world would occur somewhere between September 15 -17, 1994 (p.531). He couldn't predict the exact day when Christ would return, but was convinced he could narrow it down to the month and year. He also admitted that he could be wrong. His latest attempt to predict the return of Christ includes a host of billboards all around the world declaring the date to be May 21, 2011. The image below was taken from his web site on December 8, 2010. Update: May 21, 2011 came and went! We are still here! Since his last failed prophecy concerning Judgment day, Harold Camping has revised his prediction. How many failed prophesies does it take to be considered a false prophet? Just one! Why is this false prophet listed on this web site? He is leading many people astray! Enough people follow Harold Camping to support radio ministries worldwide, the printing of books, tracts, CD's, and hundreds of billboards worldwide. Harold Camping is fleecing God's people and can be considered a cult leader.